Michele Neligan – I loved my first photo shoot with Tom at the Everson Museum. So, I jumped at the chance to go again. I learned so much that it’s hard to put it in writing. I always felt I had the basics down, but this “All the Angles” workshop brought my awareness to whole other level. We reviewed our pictures after our shoot and discussed why we took the photo the way we did. It was interesting to listen to the other photographers in the group. Everyone had a different perspective. Then Tom made suggestions on processing and cropping. I also had some one on one time with him learning how to bracket photos. That made the day that much better. He’s a great teacher and I can’t wait for my next outing with him in March. I would highly recommend his classes. There is no end to what you can learn and/or do in photography. Steve Brady – I really liked the format of the “All the Angles” workshop held in February, 2019 at the Everson Museum. I liked the focused objective of the workshop – looking for lines and angles in both the building and artwork. The day was organized well, with little things (coffee), the tutorial on lines/angles, and the general tour of the museum all getting us warmed up for going out on our afternoon shoot where we could try out some things that we just learned or saw on the museum tour. The time for our afternoon shoot flew by, but that was OK because we had a very instructive critique of some of our best images for the last time segment of the workshop. I left the workshop with some nice images, new information and skills, and made some new photo friends. Bottom line, it was a great day. I like the idea of the one day workshops focusing in on one or two aspects of creating a desirable image. It helps us focus and not be overwhelmed by the scene. I would recommend these workshops to all levels of photographers who are looking to improve their photography skills. Marvin Patnode – My wife and I just attended the “Quiet water of the ADK” workshop with Tom Dwyer, It was a spectacular success in every way. I learned a great deal about composition and what I wanted each image to say – thanks to Tom’s patient explanations. Tom is a great teacher with a keen sense of humor that kept us laughing throughout the time we spent with him. 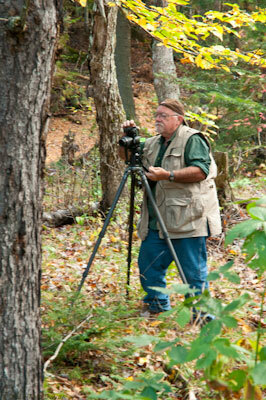 It was a wonderful 4 days in the wilderness while taking pictures and sharing in Tom’s camaraderie. My wife and I look forward to sharing another workshop with Tom. Sandi Patnode – We just finished a workshop of Toms’ called Quiet Waters of the Adirondacks. Two things that I can assure you of, 1- You get your money’s worth. You are out shooting the sunrise early and out catching the sunset late and everything in between. There is no down time in his clinics. 2. He does his homework. We had so many different areas to shoot with great scenery to photograph. I came away with a lot of knowledge that I did not have previous. One of the best things is going over some of your pictures and learning more about composing them. It was a great week of shooting and learning and I’m definitely looking forward to the next clinic. Don Delong – After the Shenandoah National Park workshop – The recently completed Shenandoah Workshop was my first workshop with Tom Dwyer. Throughout the booking process, I found Tom very easy to work with. As the workshop commenced Tom proved to be a very likable and knowledgeable person and photographer. Shenandoah National Park is well known for its vast vistas during sunrise and sunset and Tom had us in place at the best locations during this time. This type of shooting is very weather dependent and although conditions were less than ideal because of the weather (sometimes too nice) our group got creative and came away with some stunning photographs! There were several other options for shooting that included abundant wildlife, streams, and waterfalls. One of the best things about shooting with a group of photographers you don’t know is seeing what they see! You look at their photos and even though you were with them you wonder why you didn’t see the same shot? A very learning experience…in my opinion, the most important lesson to be learned…..improving your vision. Martha Lanctot – After the Shenandoah National Park Workshop – The Shenandoah gallery looks terrific. I think we all can be proud, especially you as our teacher and fearless leader. A couple of thoughts: Your workshops provide a “safe space” where we can try new ideas and experiment with unfamiliar techniques. You give guidance – not direction. The critiquing sessions are also “safe” in the sense that each participant knows he can give and get honest feedback without being ripped to shreds. Secondly, we are never meant to feel we are holding the group back by not being physically able to complete a hike or climb down an embankment. We can choose the venue that works best for each of us. I really enjoyed the chance we had to share photos we shot and to critique how they could have been made better. – Evelyn D., after the Baltimore Woods Winter Workshop. Peter D. after the Baltimore Woods Winter Workshop –I found that, with some help, it was possible for me to go beyond snapshots and capture some of what my mind sees. I think the format that you use (for your workshops) works well. I’ll be looking for more time in the future. Gerald L. after the 2011 Letchworth State Park Tour –I enjoyed chasing the light every morning and evening. I enjoyed shooting things other than the vast landscape. And, I learned a lot during the exercise in which we had to get that “wow” shot using only one lens. Tom knows the park and its scenic spots exceptionally well. At each stop I roamed around looking for a shot. I knew I was not ignored when Tom would appear with and insightful idea or comment. Sally F. after 2010 Getting Ready for Winter workshop –I enjoyed every minute of your workshop! Learned so much and appreciate the tips and information that you gave us. I took a walk yesterday and looked at every bit of the area on our road in a new way – so much to see! I will send you some photos when I get an interesting one. Chuck L. After the CNY Photo Tour – .I would like you to know that the money spent for your CNY Photo Tour/Workshop was some of the best money I ever spent. I walked away with more knowledge and tips than I could possibly glean from a book or tutorial in over a month’s time. This is due to your patience as well as your unselfishness sharing of your knowledge. Your love for the craft definitely shines through as well as having a wonderful demeanor with the folks you are teaching or working with. I felt invigorated by Saturday’s workshop. Always photographing by yourself can get a bit lonely at times and just the time spent with everyone makes it more fun, along with the fact that it also gives you a bit of a challenge to try just a little harder. Lauren J –There was just enough info without it being overwhelming. You also spoke in a language that everyone could understand.